Carey Young, Missing Mass (2010) Details as below. Etienne Chambaud, Flat Source Negative (2015), Photograph from Acryl scratched negative, buried box, certificate. Copperfield, London is pleased to present Et Mon Droit, an exhibition that explores the intersection between contemporary art and law. Abstracted from the longer phrase Dieu et mon droit', the exhibition's title literally reads 'and my right'. Re-contextualising this heraldic motto which is commonly found on UK legal documents and coinage, the meaning of the phrase is subtly diverted. 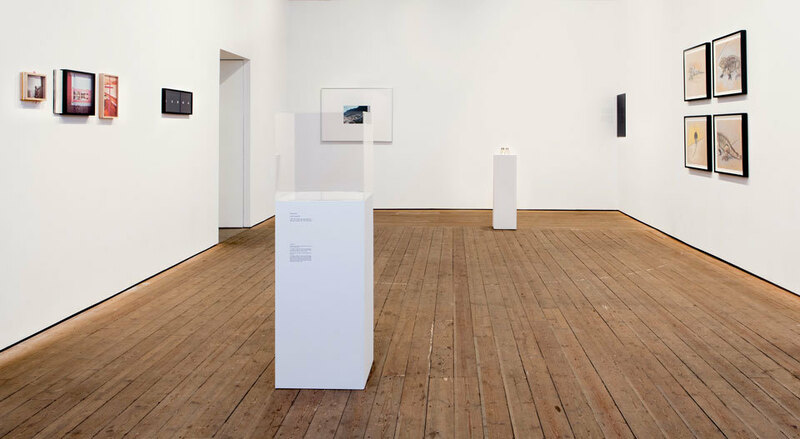 A similar form of repurposing can be found throughout the exhibition which focuses on contemporary artists' use of law and its convention as a medium with which to make work. We live in a world of contractual obligations, disclaimers and conventions and yet here legality becomes a malleable substance; a form of creative material with vast potential. While by no means exhaustive, Et Mon Droit is not limited to the presentation of written contracts; encompassing sculpture, performance, photography, installation and video. Extended text follows concerning specific works. Dr Jo Melvin, Daniel McClean, Dr Nina Power, Carey Young. Chaired by William Lunn. For full details please click here. 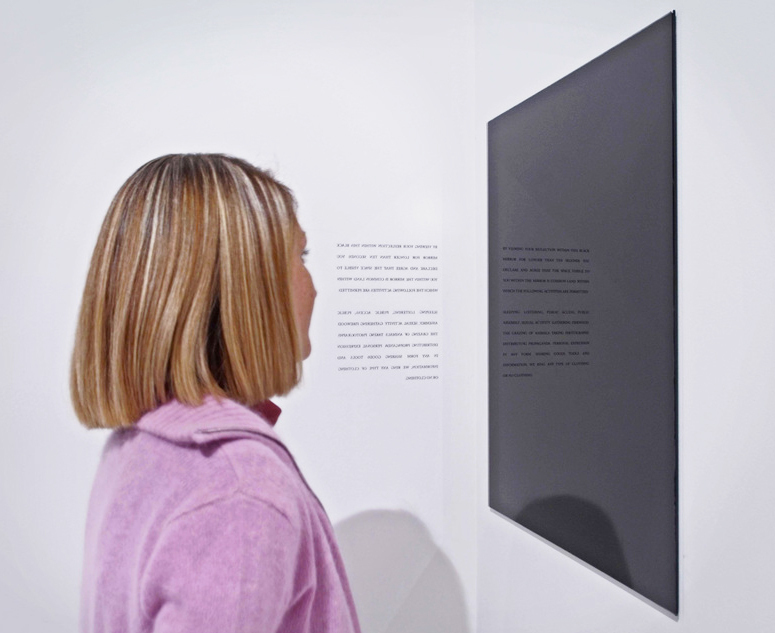 Carey Young's Obsidian Contract presents a legal text written backwards and reflected in a black mirror, a device which has a long tradition within witchcraft and the occult in many cultures. The text proposes the exhibition space visible in the mirror as a new area of publicly-owned land, in which certain activities considered illegal in public space at different times are made permissible. 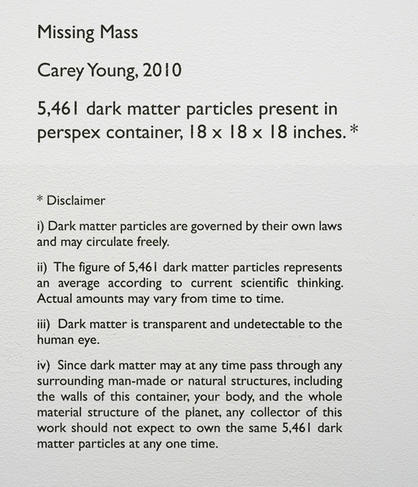 Engaging with another more contemporary aspect of the law in the form of the disclaimer, Carey Young's Missing Mass posits dark matter particles as an in-confinable commodity - perhaps the only truly free substance in the universe. Withdrawn Certificate by Jason File is a contradictory triptych by intention, challenging the meaning of legal documents in the art world. 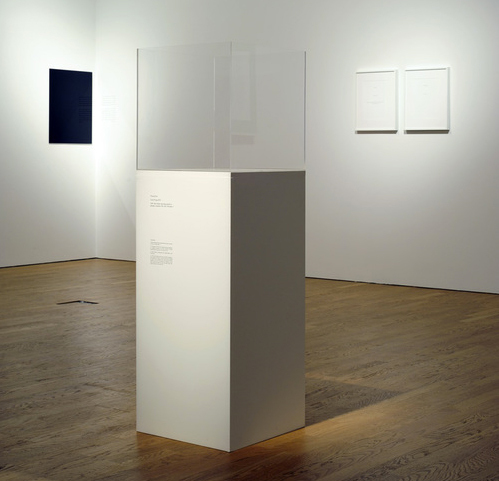 Its components initially appear as three interconnected artwork authentication certificates: a facsimile of Dan Flavin's certificate of authenticity including the signature of the artist, a meticulous copy drawn by Jason File himself and the certificate of authenticity for the drawing. 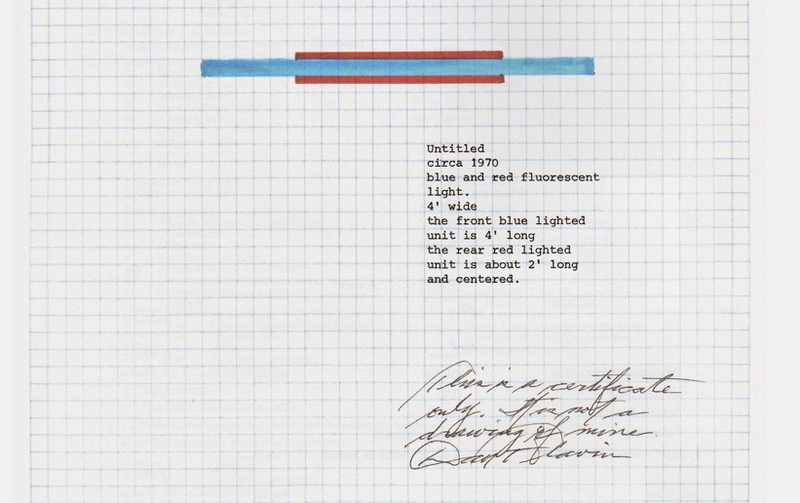 The first two parts (facsimile and drawn copy) recreate Flavin's original hand written note clarifying that although the certificate bears his signature it is not in itself a work of art. This is juxtaposed with Jason File's own certificate of authenticity which states that his drawing, regardless of any represented text in the drawing, categorically is a work of art. The work creates a paradox that raises questions regarding the nature of the interactions between art and law, in particular where the law conveys or protects value. Dealing with legal language rather than the directly contractual, David Birkin's Existence or Non Existence, from the series Severe Clear, records a performative action based on an extract of text. 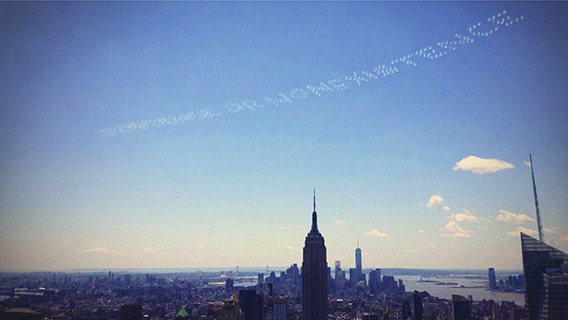 The phrase is taken from a rejection letter sent by the CIA to the American Civil Liberties Union in response to their Freedom of Information Act request for information relating to the US Government's classified drone program. The full reply reads, "...the CIA can neither confirm nor deny the existence or nonexistence of records responsive to your request." 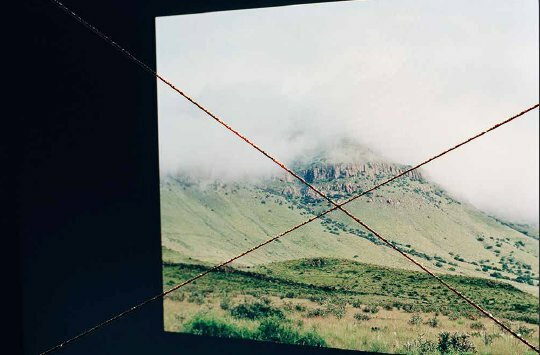 Etienne Chambaud engages the certificate of authenticity in a different context however, creating a work in two parts with a photograph that marks the spot where the other part is buried. The buried case, containing the negative of the photograph, is engraved with a certificate of authenticity that states that legally the material ceases to be a work if the case is ever opened. Marco Godoy takes a more directly physical approach, systematically erasing all visual information from a series of coins. In doing so he both erases the legal documentation and affiliations on the surface and simultaneously implicates himself in a criminal act according to the law that governs the usage of these metal tokens. Like Young's Missing Mass, Godoy highlights a peculiarity of ownership in that we never actually own any physical currency by law, only the value it promises. Known for seminal works like Auto Portrait Pending - a contractual work obligating the owner to fill an empty ring setting with a diamond made from the artists remains after death - Jill Magid's most recent and ongoing series engages with copyright law and intellectual property rights to consider what it means for a corporation to own an artist’s legacy. Following Vitra’s acquisition of the archive of Pritzker prize-winning, Mexican architect Luis Barragán, the Swiss furniture firm set up the Barragán Foundation at its corporate headquarters. The Barragán Foundation owns complete rights to the architect’s name and works, as well the majority of the photographic records that were so important in securing his success. While Magid chooses to focus on Barragán and the challenges of accessing his archive, this work is indicative of wider issues around the future of creative legacy. 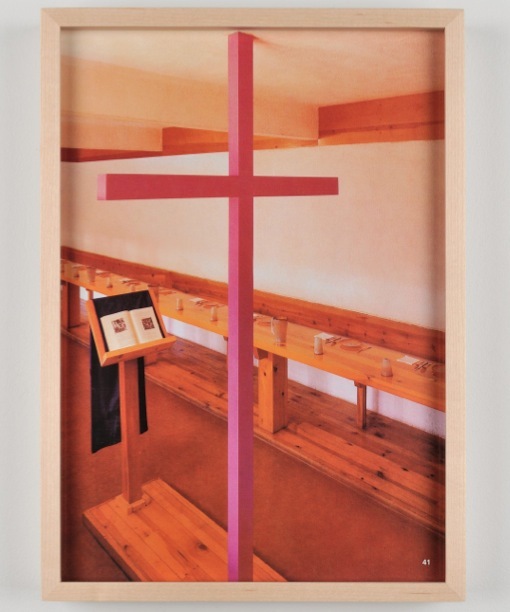 By re-framing and re-contextualizing already published images (thus avoiding copyright infringement), Magid finds new ways to engage and exhibit documentation of Barragán’s practice by pushing the limits of what his Swiss owned Estate can legally prevent. David Birkin's Cyclura nubila employs the court approved processes and personnel used to document Guantanamo trials. 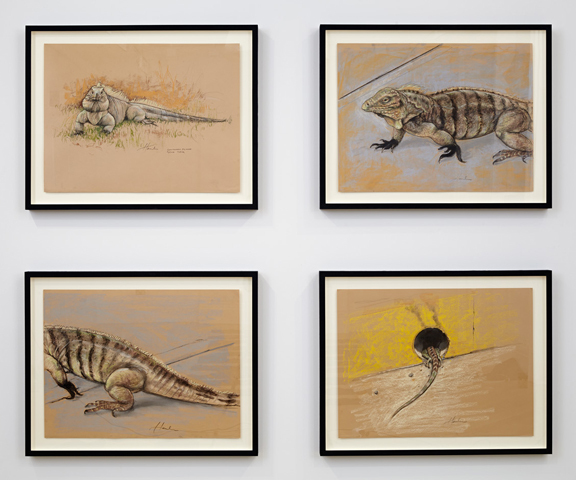 Referring to the particular efforts of Tom Wilner to persuade the Supreme Court to hear the case of a group of Guantanamo detainees, Birkin commissioned official courtroom artist Janet Hamlin to document the iguanas (Cyclura nubila) that were pivotal to his argument. Under the US Endangered Species Act, when the iguanas enter the naval base they are protected by US law, with fines of up to $1,000 for harming them. Convincing the Supreme Court to hear the case, Wilner argued that if they extended jurisdiction to iguanas while denying the detainees due process, they would be affording more rights to reptiles than human beings.